Crowbars, and other prying devices; Lock picks and devices used for opening/decoding locks; Screwdrivers, pliers, hammers, and other common hand tools; Ropes for climbing; Masks, gloves, and other clothing; heavy duty tools capable of burning through concrete, steel, and other solid materials; explosives like dynamite or gunpowder….. if you are wondering what the group is … one can be arrested by Police for possessing them in a public place… ! ~ these are some of ‘burglary tools’ or devices that are used by persons committing burglary. Also called “burglar’s tools”, or burglar tools, they are illegal to possess with the intent to commit a burglary. Intent to commit a burglary is required in order to be charged with possession of burglary tools. A court usually considers the totality of the circumstances when determining if a person intended to commit a robbery ~ and that includes – the way the accused is dressed; the time of the day; the location and more……..
J.C. Bamford Excavators Limited, universally known as JCB, is a British multinational corporation, manufacturing equipment for construction, demolition and agriculture. It produces over 300 types of machines and one known to us is –JCB Excavator …. JCB was founded in 1945 by Joseph Cyril Bamford, after whom it is named. Excavators are heavy construction equipment consisting of a boom, stick, bucket and cab on a rotating platform. 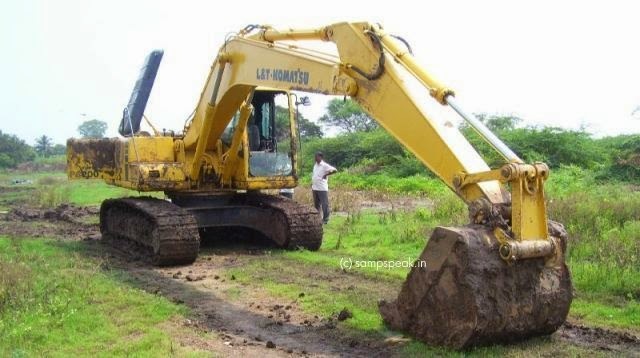 file photo of an excavator. Burglars usually attack windows that are less visible to neighbors. Burglars usually break a small hole in the glass and open the window, but sometimes a smart burglar breaks all the glass and enters through the broken glass and doesn’t open the window. There are smart burglars who use sophisticated electronic gadgets to gain entry … especially into high end vehicles beating its security features. Often Insurers require tell-tale evidence of burglar breaking-in … for admissibility of a claim…. and this one in Nagpur reported in TOI is quite different than the oft-heard ones….. The report states that thieves in city are getting more and more brazen. So far they used duplicate keys or crowbars to break into homes and shops.Now they are using excavators. Unidentified thieves used a giant JCB excavator to break open a mobile shop in Sitabuldi and took away gadgets worth Rs 3 lakh on Wednesday night. Though the showroom where the theft occurred is hardly 500 metres from Sitabuldi police station and a PCR vehicle is stationed at Variety Square, the police remained blissfully unaware. Owner of Shri Dadaji Mobile Shop on Sitabuldi main road, Ravi Sawaitul closed his showroom at about 9 pm. Thieves got an excavator in the night to break open the shutter and decamped with the booty. The neighbour heard the crashing sound and saw an exacavator moving away from the place and some youths picking up the booty and following the machine. They were gone before anyone could raise an alarm. A police team reached and conducted spot panchnama. Police said they were trying to ascertain who was behind the theft and added the thieves had come well prepared. Sawaitul has rented the shop and suspects the landlord might be behind in the incident as he was asking Sawaitul to vacate the place. Somebody adding excavator to the repertoire of burglar tools, is indeed new !